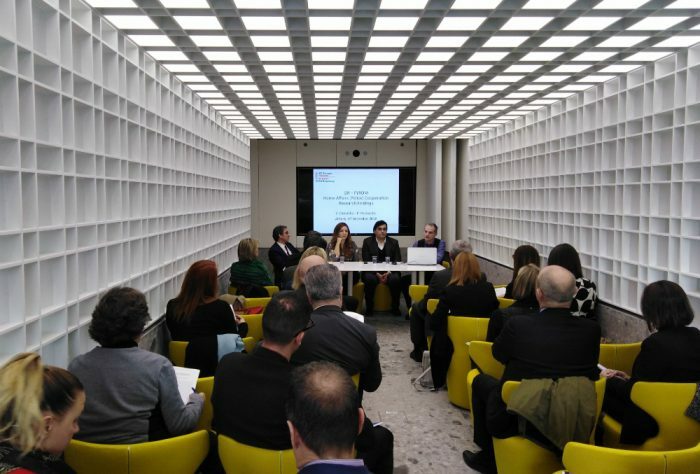 On Monday, December 17, 2018, at the offices of the Hellenic Foundation for European and Foreign Policy (ELIAMEP), the South-East Europe Programme co-organized with the Swedish Embassy in Athens and the research institute Analytica a presentation of the findings of the research project conducted jointly with Analytica, on the development of cooperation between Greece and the former Yugoslav Republic of Macedonia. The report is entitled “Bilateral cooperation between Athens and Skopje in the fields of Justice and Home Affairs (Police): An assessment of the state of play before and after the adoption of the Confidence Building Measures (2015)”. The research was funded by the Swedish Ministry for Foreign Affairs. The results were presented by the researchers and authors of the research, Yorgos Christidis and Panagiotis Paschalidis. Researcher Magdalena Lembovska and the President of Analytica, Veli Kreci, presented the results of Analytica’s research. Opening remarks were given by H.E. the Ambassador of Sweden in Greece, Charlotte Sammelin, Ioannis Armakolas, Assistant Professor and Head of the Southeast Europe Program of ELIAMEP and Veli Kreci, President of the research institute Analytica. Angelos Athanasopoulos, diplomatic editor of the newspaper “To Vima”, commented on the findings of the research and the new momentum in the relations between Greece and FYROM. Finally, a brief discussion followed which was moderated by Ioannis Armakolas. Find the report in english, here.